The plaque marking the discovery of the quarternions, Dublin. 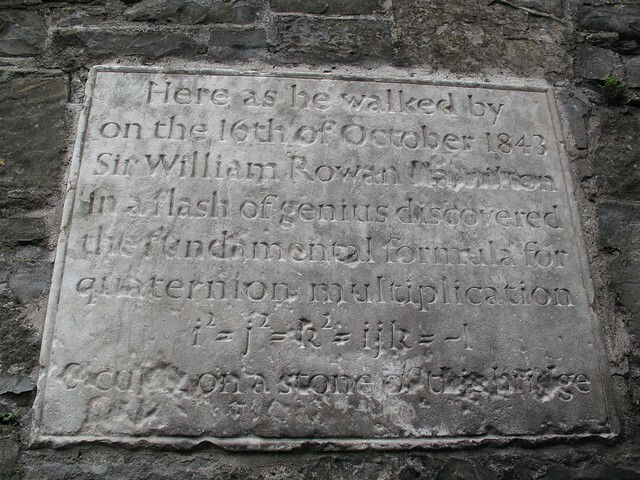 I’ve spent the last three days in Dublin, and whilst there I couldn’t resist taking a rare opportunity for mathematical tourism. Hamilton figured out the structure of the quarternions in “a flash of genius” during a morning walk along Dublin’s royal canal, carving them into the nearby Brougham bridge. Whilst the carving does not survive, there is a plaque at the spot to mark this discovery, and it was that I set off to see. Getting there doesn’t seem too difficult, though: I got the 120 bus from Parnell Street (conveniently close to my hotel on Parnell Square) to Broombridge road. This is the opposite of advice found elsewhere online, but the suggested 20 route doesn’t seem to exist any more. If you have a map, it’s easy enough to follow the bus route, but as I didn’t I just asked the driver to give me a shout when we got there. Brougham is pronounced broom, so all you need to do is to find where Broombridge road crosses the canal and (it turns out) railway tracks: presumably taking the western suburban line would be an even easier way to get there, as the platform is next to the bridge. Of course, I went the wrong way along Broombridge road, which is easily detected by reaching the end without finding a bridge! It’s been described as “the least visited tourist attraction in Dublin”, partly because the area isn’t particularly appealing today but presumably because there aren’t that many mathematical tourists! It does seem a shame that the site – and Hamilton – are so overlooked compared to the attention that, say, local authors or artists get. But it’s better than nothing, as mathematical tourist attractions are few and far between, especially outside of universities. The bridges of Konigsberg are often suggested; I’d also be fascinated to tour Japan in search of sangaku. If you have other ideas, why not mention them in the comments? I was doing some search on a project I am working on relating to Wasan geometry. Found your site and enjoyed your (and your group) prolific writing. Great pleasure – insightful comment – Keep at it!